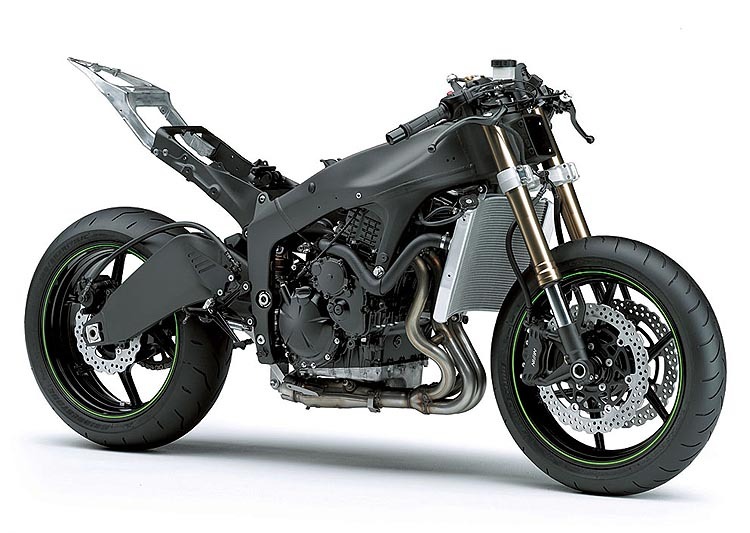 Were used to big pistons making us go faster, but on Kawasakis 2009 ZX-6R its big pistons which are designed to slow the bike down more effectively. The Showa front forks are appended BPF, which stands simply for Big Piston Forks, and Kawasaki claims improved stability and better damping because of it, especially under braking when the forks are working their hardest. 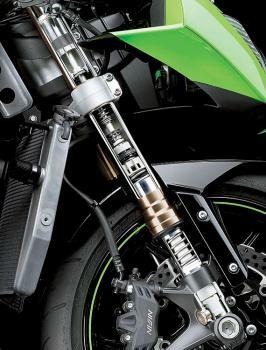 Click on image for galleryMost other sports bikes are fitted with cartridge forks, where a piston moves up and down through the damping oil within a sealed damper cartridge. As it does so, the oil is forced to pass through orifices into a stack of flexible shims. When the pressure is low, which happens in gentle fork movement such as over long undulations in the road, just one or two shims bend apart to let the oil through. At very high pressures, such as when the front wheel hits the edge of a pothole and the forks compress very quickly, all of the shims bend apart and more oil passes through more quickly. This system is superior to simpler forks where the piston, instead of having a shim stack, has a series of fixed size holes in it. As it moves along the fork leg the oil passes from one side to the other through the holes. Its cheap to make and easy to understand, but the problem here is that fluids resist this sort of thing in proportion to the square of the speed theyre being asked to flow. So at low damper speeds theres very little resistance, but at high damper speeds (hitting a kerb is the extreme, but bumps and ridges are normal) the fluid refuses to flow through fast enough, so you get hydraulic lock and the forks dont compress at all, just when you need them to the most. the consequence is a very harsh ride and poor grip as the tyre stops following the road surface accurately. You get reasonable damping in the mid ranges of the suspensions speed (not the same as the bikes speed, were talking about the speed of suspension compression and extension) but its inadequate at low speeds and too strong at high speeds. BPF forks gain advantage by reducing the speed range over which the damping fluid has to flow. 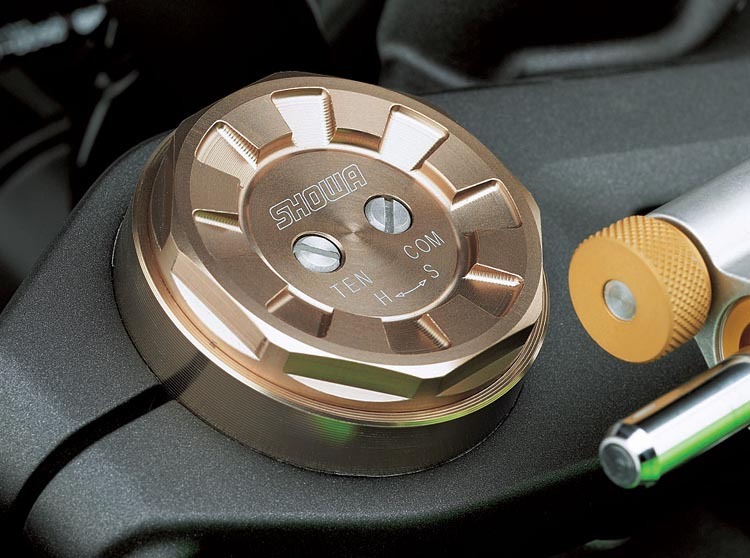 Instead of having an internal cartridge, the whole of the fork leg effectively becomes the cartridge, so the piston can be much bigger: 37mm diameter on the new ZX-6R instead of 20mm diameter on the old model. This increases the area of the piston by almost three and a half times, and in turn that means it can flow more oil at lower pressures. Effectively the whole operating range of damping oil speed is reduced, and its rate of increase is decreased too, meaning the damping control is substantially improved in particular at lower suspension speeds, such as when the front end is beginning to compress under braking. Theres also a reduced danger of hydraulic lock, which reduces harshness on poor surfaces. Expect to see more BPF forks, with their characteristic compression and rebound (also known as tension - see the image above right and in the gallery) adjusted from the top of the forks. Kevin's funeral was held on Thursday 28th February 2013 and was well attended by family, friends and colleagues. The Telegraph has very kindly established The Telegraph Kevin Ash Fund to assist with the education of Kevin's three daughters. If you'd like to make a donation then you can use the PayPal 'Donate' button below which will allow you to donate from your PayPal account, or via credit or debit card. A small percentage (about 3.4%) will be retained by PayPal for the service. Kevin's family have been touched by the generosity and messages of support from people using the website and would like to express their gratitude to those who have contributed in any way. The donations keep coming in, thank you so much, and the family especially like it when you leave a message. We're familiar with solid-state electronics in biking. Ignition swapped points for transistors in the 1970s, then went digital in the 1990s. Now, the need for greater power, fuel efficiency and emissions control means modern engines only work with computer-controlled fuelling, ignition, combustion and exhaust. When we open the throttle we pull the strings, but the ECU calls the shots. To do it, the ECU needs an accurate view of the world. And it gets it through its sensors. A gyroscope is a rigid circular or spherical mass rotating around an axis and for over 100 years motorcycles have come with three of them: a front wheel, a rear wheel and a crank (if you're being pedantic you could include cams, balancer shafts, gearbox, clutch etc). The classic mechanical model of a gyroscope ranges from the very small – electrons spinning around an atom's nucleus – to the very large – the Earth. Most of us have an innate feel for balancing a high centre of gravity on a relatively short wheelbase. Say, like a motorbike. Its centre of gravity is the point at which the sum of the surrounding mass is zero, and is largely determined by the location of the engine, the heaviest part of the package. Usually the CoG is midway between the wheels (half the wheelbase) and 60 to 75cm off the ground; just above the engine, in front of your knees. Or at least it is until you get on. From the launch of Yamaha's new Super Ténéré: "The exhaust pipe connection between the two headers is discontinued to give more character to the engine. The link pipe gives a flat feeling to the curve, so removing it makes the engine a bit more peaky." This is all about exhaust gas. When a four-stroke is tuned for power it means more revs, and so the cylinders have thousandths of second to fill with fresh mixture, compress it, burn it and pump it out again. To get enough mixture in and out, inlet valves open early and exhaust valves stay open for longer – so both are open at the same time. Written content on this site is copyright Kevin Ash Limited. Images are copyright of the credited photographers and are used with their permission. Feel free to link to this site, with quotes or teasers if you wish, but please do not steal from it. Copying entire features or images for your own site is theft - get in touch instead, maybe I can help.